Happiness is Blogging in Lanzarote | Letters from an unknown author! I think I’ve finally sorted out my scheduling issues as my last post was published (successfully) on a Saturday in line with my new posting philosophy; a new blog every Saturday! 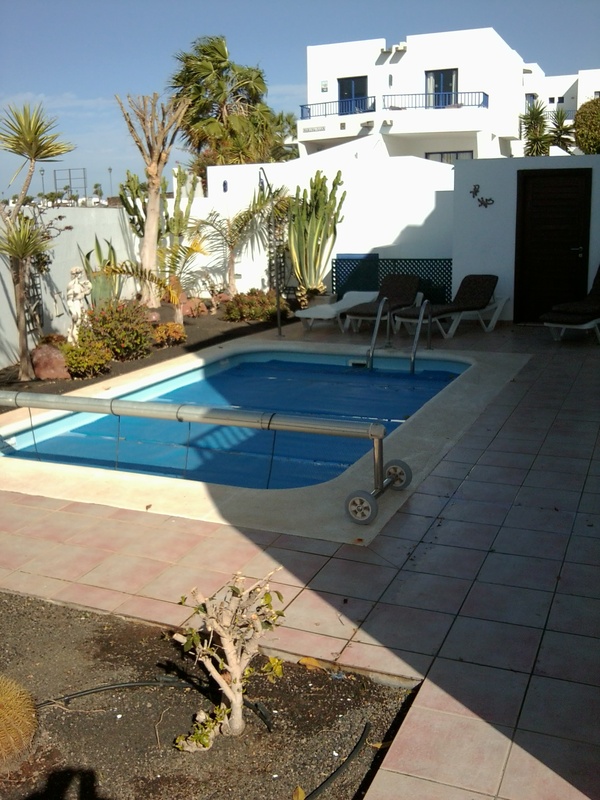 Anyway, I arrived in Lanzarote on the third of January for a long six week break so I’ll have plenty of time to write! Recently I applied for a managerial promotion and even though I was unsuccessful I did get the opportunity for a temporary promotion as my own manager had been seconded elsewhere. The extra money came in very handy over Christmas but my blogs have suffered. When it’s a little quiet at work I always take the time to try and write something, not always a complete blog but at least something that I can use and work into a blog at a later date. As a manager though that whole concept went right out the window because there was always something to be done; something that needed sorting out. I did get a big bonus in my pay packet but believe me, I really did work for it. Anyway, plenty of time now to relax in the warmth of Lanzarote, contemplate where I went wrong with my manager application and to work hard at blogging and promoting my book, Floating In Space. I do hate the cold which is one reason why I’ve flown away from the cold of the UK in January. Here in Lanzarote it’s like an English summer’s day; warm but not too warm. Dinners outside on the patio, barbecues, and a lovely warm heated pool. Getting here though wasn’t that easy. Blackpool airport closed down recently which was only ten minutes away from us so instead we had to trek to Manchester Airport, that huge bustling place a good hour’s drive away. Checking in our suitcase wasn’t so bad but the hassle of passport control and the hand luggage check; what a nightmare. We’d left a bottle of water in our bag so that came back to haunt us, my laptop and Liz’s I-pad (which have to be x-rayed separately of course) ended up in one area and our ‘suspect’ case in another surrounded by security people who then emptied my water away and squashed my sandwiches! Not happy! Al-Qaeda have a lot to answer for! Anyway, getting back to Lanzarote, did I hear people say –six weeks in Lanzarote? Yep. Six weeks away from the cold and hopefully at the end of those six weeks, that will be six weeks’ worth of blogging, of promoting my book, of e-commerce and networking and even hopefully some good work gone into the follow up to Floating In Space. In my first week I’ve done a huge amount of networking and almost trebled my twitter followers. For a newcomer to self publishing it’s a pretty hard learning curve and there are plenty of blogs out there telling you how to get more followers, how to get more likes and so on. Click here to see a pretty interesting one but at the end of the day it’s you who has to do the work: You who has to make your blog successful. I’ve noticed on twitter there are plenty of people and companies claiming they can tweet your book and get you a guaranteed thousand followers or more but it all comes at a price. Is it worth it? Well, if it brings in followers and they read your blog and buy your book or whatever product you are selling then great, but if not then that’s more money spent on a wasted avenue. Here’s an interesting post by an author who hit number one on the amazon best seller list and seemed to make his major breakthrough by showcasing two books together and alternating each book as a freebie download over a set period of time. Looks like it worked for him. Happiness is a warm gun, or so said the Beatles on the white album but for me after a morning writing it’s a glass of red wine on a warm summer’s evening, my favourite salad (onion and tomato) and something cooking away on the barbecue (courtesy of Liz) or the prospect of a short walk down to the marina at Playa Blanca for an evening meal. Anyway, that’s enough for now, think it’s time for a swim! This entry was posted in The Life of a Writer and tagged author, blog, book, holidays, lanzarote, people, promotion, self publishing, travel, writing. Bookmark the permalink.